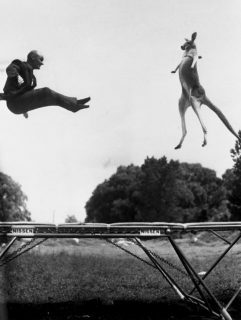 In 1960, George Nissen, former gymnast and inventor of the trampoline, borrowed a kangaroo from a farm on Long Island and trained it to jump with him in Central Park as a publicity stunt to promote the use of his unique invention. The resulting photograph was so astonishing it was reprinted in publications around the world and helped establish the trampoline as a global phenomenon. Bounce! 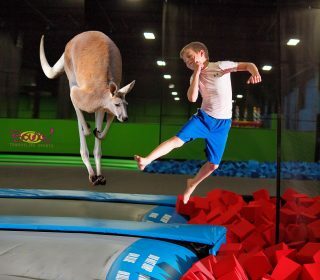 Trampoline Sports, the first trampoline park in the New York area, had its first full year of operation in Valley Cottage in 2012 and in 2014 opened its second location in Syosset. To celebrate the tie-in with Long Island, the Syosset location recreated the spirit of the original photograph to draw attention to the many health and fitness benefits derived from trampoline sports. During its first year, Bounce! developed a hugely successful sports program, the positive effects of which can be seen in the children who go to Bounce! on a regular basis. “We watched the kids playing and listened carefully to what parents had to say. With that information, we devised a simple tag line that says it all…’so much fun, the kids won’t know its exercise,” co-owner Danny Fried said. Bounce! in Valley Cottage is a 30,000-square foot parent friendly ‘fun factory’ equipped with multiple slam-dunk basketball lanes, two trampoline dodgeball courts, dual foam-pit jumps, an enormous free-jump court, an Xtreme Ninja obstacle course, and a separate Bounce Jr. zone for toddlers. Unlike typical backyard trampolines which are raised above ground and have limited surface area, Bounce! offers wall to wall trampolines with heavily padded spring coverings and court monitors to strictly control every court. More information at www.bouncevalleycottage.com or by calling 845-268-4000.